?What is the difference between full tort and limited tort car insurance? ?Have red light cameras reduced the number of car accidents at intersections? ?How does Google Maps know when there’s heavy traffic or a car accident? Although responsible drivers can take steps to avoid car accidents—such as obeying speed limits and avoiding distractions—car crashes still happen frequently. In the event a car accident does occur, you should know how to properly handle the situation, stay safe, and protect the compensation you’ll need for bodily injury, property damages, or lost wages. Get to safety. If your accident is minor, you and the other driver involved should move your vehicles out of the way to decrease the chance of causing another accident. However, before you do this, it’s vital that you take photos and videos of the original positions of the vehicles right after the accident. Then, move the vehicles to the shoulder of the road. Call the police. Law enforcement is able to step in and mitigate any tension after a car accident and can call for the proper emergency or non-emergency medical professionals. Additionally, law enforcement is a third party who can document what happened, procure statements from those involved, and keep the scene of the accident safe with cones and flares. Inform your insurance company. Make sure your insurance company knows you were involved in an accident. They’ll be able to work with you, the evidence you collect at the scene, and your attorney to make sure you get adequate recovery for your injuries. Seek medical attention. Even if you feel fine or suffered only minor injuries in the car accident, it’s important you get medical attention. Often, car accident injuries can surface days or weeks after the incident. A medical professional will be able to tell you if you need further medical attention. Get the other driver’s contact information. Depending on the severity of your injuries, attempt to safely exit your vehicle and speak with the other driver involved—making sure to note his insurance information, driver’s license number, contact information, and vehicle details. Speak with bystanders. In addition to speaking with the other driver, find people who may have witnessed the accident and ask questions. If you don’t have pen and paper, use your phone to record what they saw and their contact info—in case your attorney and law enforcement want to speak with them. Take photos and videos. To assist your insurance company and attorney during the claims process, take extensive photo and video evidence of your injuries, injuries of your passengers, damage to your vehicle, damage to the other vehicle, and the whole scene before any vehicles are moved. Stick to the facts. When you speak to anyone at the scene, be sure to avoid saying anything that might be misconstrued. Apologizing to the other driver, exaggerating your injuries, or giving an inaccurate account of events to law enforcement can all hurt your claim. Be factual when you speak—and remember to avoid speaking with the other driver’s insurance company at all. Simply refer them to your injury attorney. Follow up with your doctor. If your injuries were severe enough to warrant further medical help, it’s important you make all scheduled appointments on time, follow all instructions given to you, take any medications prescribed to you, and complete any exercises your doctor orders. Doing these things will show the other parties involved in your claim that you take your health seriously. Call an attorney. 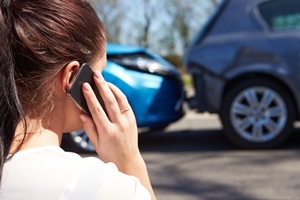 After a car accident, call an attorney who can prioritize your interests right away. Especially in Virginia, where contributory negligence law can easily compromise an injury claim, it’s important you don’t try to handle your claim alone. If you’ve been involved in an accident and feel confused by complicated laws and paperwork, call an attorney to assist you. The team at Kearney, Freeman, Fogarty & Joshi can take the evidence you’ve collected and use it to win compensation for your injuries, damages, and losses. To get started on your case, call us at 877-652-1553.